Report released September 5, 2017 due to Labor Day Holiday. 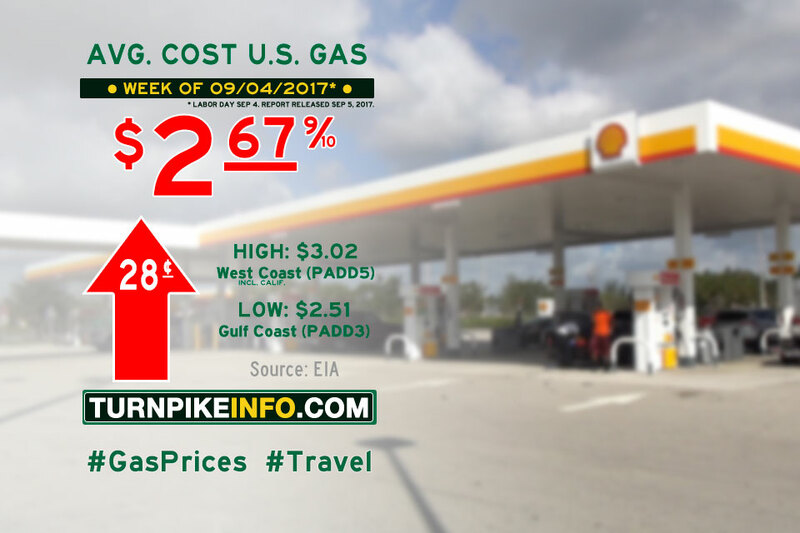 Fort Lauderdale – The 2017 hurricane season has taken its toll on fuel prices nationwide, with gas prices making steep gains in the wake of Hurricane Harvey. The storm resulting in a number of refineries shutting down across Texas and into Louisiana, choking the nation’s fuel supply and driving the national average price up by 28¢ per gallon. The nation’s average gas price, which was $2.40 last week, lurched upward to $2.68 for a gallon of regular unleaded. The figures are detailed in a weekly fuel price survey compiled by the U.S. Energy Information Administration. Every region took a hit, from the Gulf Coast, the site of Harvey’s impact, all the way to New England, where prices rose 35¢ and 36¢, respectively. Prices in the Lower Atlantic states, now potentially threatened by Hurricane Irma, rose by nearly 41¢ per gallon. The lowest price increases were seen in areas where prices were already the highest in the nation, notably the West Coast and the Rocky Mountains. But these regions also have more direct access to other fuel sources, and prices were only up between 11 and 14 cents per gallon, respectively. Still, the price increases were substantial enough that the West Coast region now has an official gas price above the $3.00 mark. Diesel fuel prices pinched at the wallets of truckers, too, but not nearly as much. Nationwide, the cost of diesel rose about 15¢ per gallon to $2.76. Regional cost averages for both gasoline and diesel are listed below, showing the current week and previous week. Prices are ranked from highest to lowest price. 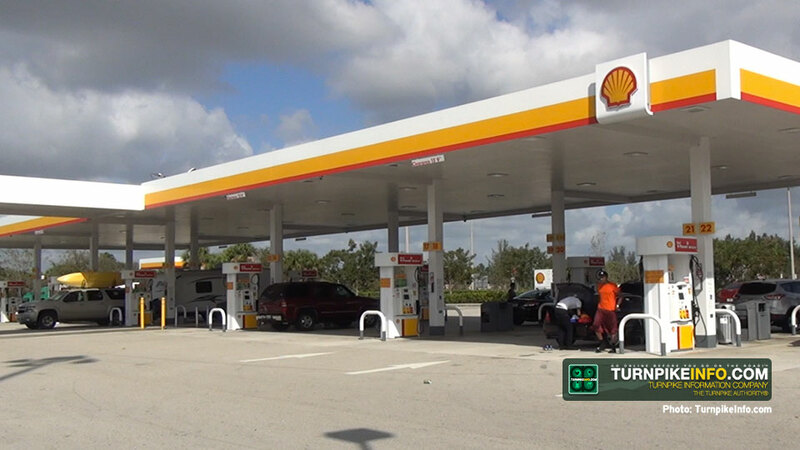 Workers at service plaza gas stations in South Florida, including the Shell at the Pompano Beach Plaza, pictured here in a 2016 file photo, reported plenty of fuel available, with no expected interruption in the delivery of new supplies. Hurricane Irma has blown up into a super hurricane, with winds of 185 miles per hour, according to the National Hurricane Center in MIami. That makes Irma the second-most powerful storm in history, only behind Hurricane Allen, which struck the Caribbean in 1980. At one point, Allen had winds of 190 miles per hour. 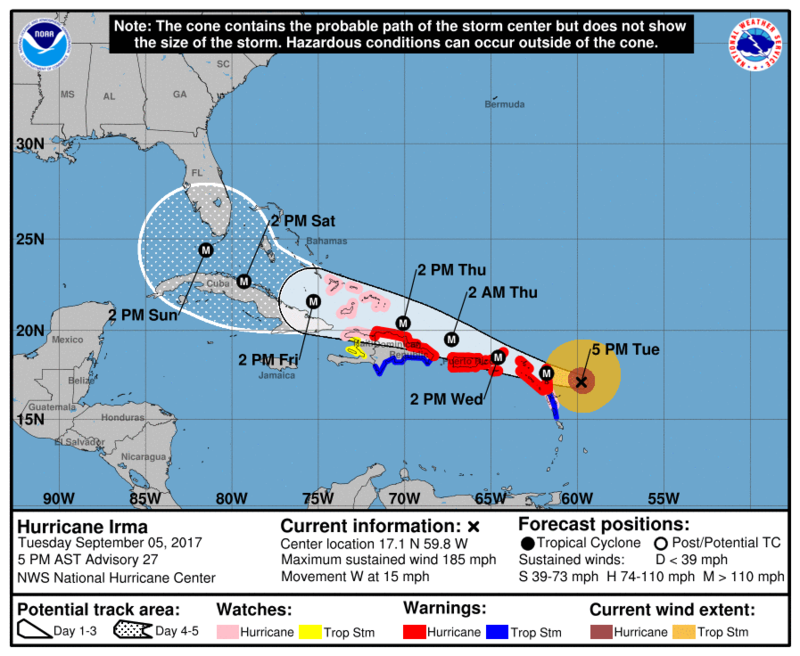 Hurricane Irma’s forecast track, from the National Hurricane Center, issued at 5 p.m. on September 5. For its part, Hurricane Irma is due to strike the northern Leeward Islands, east of Puerto Rico, tonight, and Puerto Rico, itself, on Wednesday. South Florida and the Florida Keys are currently in the forecast “cone”, or the projected path of the storm, which includes a margin of error. But Key West currently has a target on it, as the NHC forecast takes the storm’s path nearly directly over the island by Sunday. That forecast track has forced officials set planned mandatory evacuations of the Keys beginning on Wednesday for visitors and residents, although the precise time of Wednesday’s expected evacuation order had not been determined. Government offices in Miami-Dade County, along with schools, will be closed on Thursday and Friday so residents may prepare for the storm or evacuate. All school and park activities were also suspended. However, county officials had not yet issued any evacuation orders. In Broward County and Fort Lauderdale, location of the home office of TurnpikeInfo.com, government emergency operations centers were activated, but no evacuation orders had yet been issued as of Tuesday evening. Elsewhere, traffic on Florida’s Turnpike appeared light in most areas, and gas stations at service plazas in South Florida reported fuel available at both the Snapper Creek Service Plaza in Miami-Dade and the Pompano Beach Service Plaza in Broward County.